Official diploma take time to replace. A high school or college diploma isn’t just a piece of paper -- it’s proof of your hard work and dedication to completing a level of your education. If your diploma was lost, destroyed, never received or issued under a different name that you’ve since legally changed, you can get a replacement copy. However, you need to follow the proper procedure and pay a fee to get your hands on that diploma. 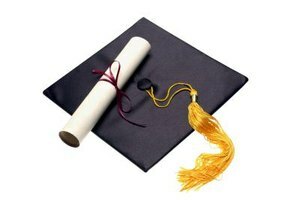 You must contact your high school or college to request an official copy of your diploma. The secretary or registrar should be able to help you or give you further instructions. The contact information will be located in a phone book or on the school's official website. You can also go in person to request a copy and fill out the required paperwork. 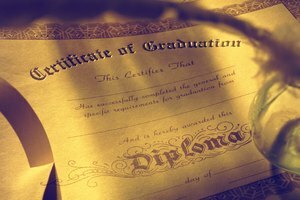 Since a diploma is an official document, you must fill out some paperwork before you’re allowed to get a copy. When you contact your school, ask them for a “Replacement Diploma Request” form. They may have a special form depending on whether you are picking the diploma up in person or receiving it by mail. You will need to provide information including your full name, mailing address, social security number, birth date and telephone number, along with any other information they require. You will most likely be required to pay a fee for a replacement copy of your diploma. Expect to pay anywhere from $10 and up. 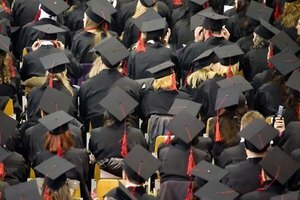 Fees vary depending on the educational institution you attended. You may be able to pay with cash, credit card, money order or check, but you should ask what forms of payment they accept before sending in your request. You may not be able to get a copy of your diploma immediately, so don’t expect to walk away with one in your hand. Often there’s a waiting period for the document to be processed and delivered, especially for an official signed college diploma. Anticipate it to take about four to six weeks. If you don’t get it within six weeks, contact your education institution to check its status. Sometimes paperwork isn't filled out properly, it can get lost or misplaced or you may have sent in a form of payment that they don't accept. New York Institute of Technology: How Do I Request a Diploma or a Copy of My Diploma? Revermann, Susan. "How to Find a Copy of My Diploma." Synonym, https://classroom.synonym.com/copy-diploma-3722.html. Accessed 18 April 2019.